All students are taught “warm up” exercises at the beginning of every lesson. These exercises are designed to warm up and loosen all of the muscle groups in the body and can be done at home as well as in the dojo and are vital to any form of physical exercise and especially the martial arts. Supplimentary training is also a part of the Goju Ryu karate way using traditional Okinawan training devices. The chishi is a concrete or stone weight at the end of a wooden handle. It is mainly used to strengthen the grip, as well as the joints of the elbows, wrists and shoulders. The exercises develop the muscles used in blocking, striking and grappling techniques. It also strengthens the arms, shoulders, abdomen and stance for a variety of techniques. The Chishi is based on the principle of leverage. The leverage of the stone weight at one end of the shaft concentrates the force upon the wrists and isolates the muscles, tendons and joints used in the specific exercise. These are gripping jars, usually made of clay with a rim around the top to grip with the fingers. Sand can be added to increase the weight of the jars. Gripping these jars increases the strength of the fingers for gripping and tearing applications. Stepping forwards and backwards in stances is practised with the emphasis on the shoulders being properly down and pulled back. A makiwara, the most central tool of Okinawa Goju Ryu Karate Do, is a striking post, with a straw, cloth or rubber clad on the contact area. It is constructed of either a combination of 2×4 s or a 4×4 tapered off at the top. It is used to condition the striking surfaces of the body and perfect striking techniques and kime. It is a common misconception to regard the Makiwara as a tool or device for producing enlarged knuckles and callouses on the fists. The callouses are merely an external indication that makiwara training is taking place, The real value is to the wrists and elbow joints and the fixator muscle of the armpit, chest and back. The makiwara is best made of indigenous Okinawa wood called “shi-ja” or of Japanese red oak. This is a stone padlock resembling the shape of an old-fashioned clothes iron. It s is used for strengthening the arms and wrists and developing powerful punches. The Ishisashi is particularly beneficial to the Goju Ryu Sanchin kata training. This resembles a barbell, usually made of wood with weights on the ends. It is usually rolled over the forearms and back, or twisted over the hips. It strengthens and conditions the affected areas. The Tan is also used for conventional weight training exercises. This is a bundle of bamboo sticks taped together at the ends. Before kicking bags were introduced to Okinawa the To fulfilled many of the requirements of the kicking bag. Full power hand and feet techniques are unleashed upon the Tou from static or mobile postures. This is a very heavy rectangular hoop, used alone or with a partner. It is used to strengthen the body and condition it for contact. This instrument was developed by Sensei Myagi. It weighs around 70kg. This ring is twisted and pressed around in solo or two man forms and it is intended to give the feeling of handling the weight of a man so that the offensive balance is understood. (translated by Sanzinsoo)Remarks: This short article first appeared in “Bunka Okinawa” Vol.3 No.6 dated August 15, 1942, and re-appeared as an appendix in the book “Chugoku Okinawa Karate Kobudo No Genryu” written by Masahiro Nakamoto published on April 1, 1985 by Bunbukan. I don’t know when it was changed, but “karate” is now written with letters as “Empty Hand” instead of “Chinese Hand”. Anyway, I am happy to know that nowadays karate is popular all over Japan as a unique Okinawan martial arts, and even it has been officially recognized by Dai Nippon Butokukai (=Great Japan Fighting Arts and Moral Association) as one of Japanese fighting arts. However, without doubt, I am sure that the roots of karate is in China. 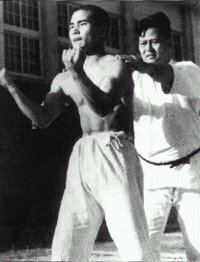 I suppose the prototype karate might be modified in various ways in my home Okinawa, but I think it is worth enough as we can see the evolution of karate which was influenced by the uniqueness of Okinawan culture. Therefore, maybe, it is not unreasonable to change the letters of karate as “Empty Hand” instead of “Chinese Hand”. I have heard that it is not sure but there is a martial art called “Three Hand” in India. I don’t know the original Indian name. “Three Hand” is the direct translation of Chinese language from Indian language. I suppose maybe such a martial art was brought to China from India by Darma during the Emperor Wu dynasty, and it became the origin of Shaolin Temple. It is very interesting for me that I saw the performance of martial arts played by a Filipino youth when I visited Hawaii last year. I was so impressed and very delighted to find that there is a similarity in techniques between the Filipino youth’s martial arts and our karate. Regrettably, I lost the notebook in which I wrote down the youth’s name and the name of his fighting arts in alphabets. I suppose it might be kept somewhere else, so I still have a chance to tell you the names if I find it. I think Shaolin kungfu is a newly systematized fusion of previously existent classical Chinese martial arts and Indian martial arts. This opinion has not been proved yet. We require more research on this hypothesis. I have been practicing karate for a long time, but I have not yet mastered the core or truth of karate. I feel as if I walk alone on a distant path in the darkness. The further I go, the more distant the path will become, but that is why the truth is precious. If we go forward to find the truth of karate by all our strength of mind and body, we would be rewarded little by little and day by day. The truth is near but hard to reach. My friend, Mr. Jingyu told me the maxim as follows: “The ultimate formula to the truth is no formula. If you wish to master no formula, you have to master a formula. If you master a formula and no formula at the same time, you can transcend live and death.” I suppose the ultimate formula to the truth is Tao, the Way. I cannot understand this maxim well, but sometimes I feel I understand it well. I think we have to master “a formula and no formula”, then we can study karate in depth and get the truth of karate. This is a miscellaneous essay for which I have not prepared, so let me talk about another subject. As to karate styles, I hear there are two types, the southern type and the northern type. In the aspect of techniques, the southern type specializes in upper body and hand techniques, so it has soft, gentle and quiet features. It is defensive in the fighting. On the other hand, the northern type specializes in lower body and leg techniques, so it has hard and active features. It is aggressive in the fighting. The former steps forward to thrust and steps back to block. The latter steps forward to kick and steps forward again to throw down an opponent. Of course both types thrust, kick and throw down, but the point of view is different each other. Now I would like to tell you about “Heishu” or “Heishu Kata” and “Kaishu” or “Kaishu Kata” to give some information to those who study karate. “Heishu” means fundamental Katas. Before entering the way of karate, you have to develop your body and mind by doing Sanchin exercise of Gojuryu. I will explain in detail. You stand straight firmly with stable stance of feet, and hands positioned properly, breathing harmoniously, then you can feel Sanchin ecstasy. It is a still version of Sanchin. We also have active version of Sanchin which has another name “Peppuren”. Usually we call Sanchin for both versions. Tanden (= a point a couple of inches below the navel), the back of the head and the buttocks are three focus points on which you have to concentrate your attention during Sanchin exercise. Brief instructions are the following. Tuck your chin in. Lift the back of your head high. Focus on Tanden (= a point a couple of inches below the navel) to charge with the energy. Your buttocks should be tucked in. These three focus points are not originally separated from each other, but have inseparable relationship. In addition to them, there is another focus point: the middle point between the eyebrows. I have heard that principles of Zen and other sitting meditations are the same as Sanchin. When I see karate-do in Okinawa, I think we tend to pay too little attention to “Heishu Kata” such as Sanchin. What do you think of this? Therefore, even if I see your best performance of “Kaishu Kata”, I would not be satisfied with it and I feel something is lacking for perfection, as you do not have a stable and fundamental base powered by Sanchin. Hearing my opinion regarding “Heishu Kata” or Sanchin, Mr. Jingyu, my friend told me an interesting story as follows. “I” in the story is Mr. Jingyu himself, not me. “Although my knowledge is limited, but I heard the following about so-called the South style Chinese paintings namely the paintings of the South Zong dynasty, and the paintings of the North Zong dynasty. Strong and vital strokes of paintings are the characteristics of Li Si-Xun who is believed to be the founder of the North style Chinese paintings. I feel strongness and toughness as steel when I see his favorite painting technique called ‘Cut by Large and Small Axes’. On the other hand, pure and gentle strokes of paintings are the characteristics of Wang Wei, the founder of South style Chinese paintings. His painting way is called ‘the Classic Style of Playing with Threads’. They say that Mr. Wang Wei is on a vegetarian diet and never eats meat, so his works reveals auras of tranquility and purity. It is not exaggerate to praise that Mr. Dong Qi-Chang calls him the King of Paintings. According to a certain book, the difference of both styles is derived from the different natural environment of the Yellow River valley in the north and the Yangtze River valley in the south. Also according to a certain man who traveled around China for a long time, the difference of the North paintings and the South ones is derived from the different character of each natural environment. In short, the South style of painting is idealism, light, flexible, gentle and quiet. On the contrary, the North style of painting is strong, solemn, magnificent and dynamic. If we apply it to Chinese fighting arts, it is completely coincident with each other. I think it has some hints. At the end of this essay, I will give you a phrase which is quoted from the famous book “Bubishi” or “Wubeizhi” written by Mao Yuan-yi in the late Ming era, in which he commented on the martial arts by taking examples of calligraphy and horsemanship.